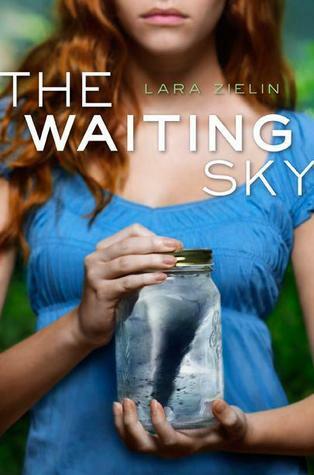 I have to admit it: I only picked up The Waiting Sky because of its cover. While I was definitely intrigued by the unique premises of this novel, its cover really drew me in with its desperation and overall feel of melancholy. In fact, I think it’s such a perfect cover because this novel itself has a feel of such deep sadness to it, but it thankfully never becomes overwhelming. If anything, The Waiting Sky truly surprised me with its depth, unique take on alcoholism, and more than anything else, its character-driven plot. When Jane’s mother drives drunk, nearly killing herself, Jane, and Jane’s best friend Cat, Jane is forced to accept that her mother has a serious alcoholic problem. Thus, she decides to join her elder brother, Ethan, while he storm-chases and get away from her mother. Yet, the whole time she’s there, Jane can’t help but question if she’s made the right choice, why her brother abandoned her and her mother, if her mother needs professional help, or most importantly if she is the one who needs help too. As far as contemporary novels go, I absolutely loved this book. I really understood these characters, despite their different situations from my own, and I feel as if their stories are imprinted in me somehow. Zielin’s writing is so beautiful, subtle, and profound that it catches you completely off-guard until suddenly you’re hurting for Jane just as much as she is. Jane herself is such a deep and multi-dimensional character that I still feel as if there is a side to her that we haven’t seen. Jane is in complete denial over her mother’s situation, which may seem strange to some, but when you read about Jane’s situation, it seems completely logical. Jane simply cannot accept that her mother is truly an alcoholic – one who puts her booze before her family – and my heart broke for Jane every time when she was forced to accept that no, her mother wasn’t turning over a new leaf, she was simply spending money on her drinks again. Jane lives a really tough life, but it is evident that she loves her mother dearly, thus, her conflicting emotions over her mother’s alcoholism are gut-wrenching and her development to grow and accept the truth for what it is is both joyous and sad at the same time. I really loved the manner in which Zielin allowed Jane to mature realistically, not only in the book, but in the heart of the reader as well. I definitely feel as if the narrative voice in this is slightly different from most contemporary novels and while I can’t put my finger on the exact quality that makes it so, it definitely helps to connect the reader with this desperately torn character. Jane aside, I loved nearly every other character in this story as well. I think what strikes me the most about The Waiting Sky is the fact that isn’t just Jane’s story, it’s the story of Cat, Jane’s best friend who is forced to watch the girl who is practically a sister to her suffer and deny the truth that is in front of her eyes; it’s the story of Ethan, the brother who feels guilty for leaving behind his sister but wants to mend their relationship so badly; it’s the story of Victor, a member of Ethan’s storm-chasing team, the Torbros, who suffers from PTSD after a dangerous accident in the middle of a storm. It’s the story of all these people and Zielin has weaved their tales simultaneously with that of Jane’s, all in the fascinating back-drop of storm-chasing. I particularly loved Jane and Ethan’s relationship as well as the friendship between Victor and Jane. I wasn’t expected them in the least, but my heart really went out to these characters as well. The Waiting Sky truly is a remarkable piece of fiction. While I did have a little difficulty trying to distinguish whether the plot focus was the storm-chasing adventures and the group dynamics of the team or whether it was Jane and her alcoholic mother, ultimately, these two ideas came together perfectly. I have to admit though, I wasn’t too big on the romance, but I definitely liked it. It did feel a bit too much like insta-love, but who am I to complain when this novel exceeded my expectations on every other count? I truly am in awe of Zielin’s writing talent and cannot wait to see what she comes up with next. Ultimately, I can only tell you to read this one, but if I could, I wouldn’t wait even for the sky to quit storming and creating tornadoes to give this one to you. It’s absolutely beautiful. Wonderful review! I've been anticipating getting my hands on a copy of this book. The story sounds really interesting. Thanks Shane! (: I can't wait to see what you think of this one - I loved it! Thanks Hilda! (: I can't wait to see what you think of this one! I really loved the concept and execution of this novel and was incredibly impressed by it, so I hope you enjoy it! Thanks Eunice! (: I love when that happens as well and Jane really is such a phenomenal protagonist! I can't wait to see what you think of her! Superb review, Keertana. :) Yay, another book to add to my YA contemp to-read pile. :) I think I'm starting to become quite the YA Vanilla Queen, don't you think? So many excellent YA contemporary novels published lately... I'll definitely have to check this out now, especially after your review! I always have trouble connecting with contemporary YA, and it's not easy for me to get attached to thoe character, but fro what you wrote about Jane, I have a feeling I might truly care for her. Her situation is so complex and i can understand why she wouldn't accept her mother's condition easily - it's not something one can judge from a distance. This is an amazing review, Keertana! Your writing is just so beautiful. This took me by surprise aswell!! I was captivated by that cover, it really is a stunning piece of art, and I was SO intrigued by the idea of storm chasers... the idea is just thrilling. But the novel itself was not quite what I expected. In a GOOD way. I fully agree with your comments on Jane, I felt that emotional connection with her, Lara makes you understand the confusing mess of her heart brilliantly. I definitely want to read more from this author. FABULOUS REVIEW!